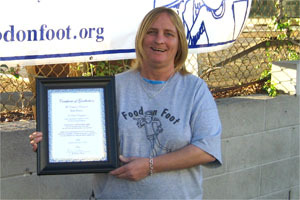 Food on Foot - Kim P.
Sunday, February 7, will be a day Kim P. will remember forever as she was presented with her certificate of graduation from our Work For Food (WFF) program. Kim has full time employment at Amoeba Music in Hollywood and is completely self sufficient. She is in her own apartment after being part of the homeless population for many years. We are so proud of her, and look forward to many more graduates entering the workforce and leaving all government assistance.